Charlotte Rose – Sanya, China. Photo by Thomas Miya/Sailing Energy. Houston Yacht Club’s Youth Sailor and US Youth World Champion, Charlotte Rose, recently returned from Sanya, China where she won the Gold Medal in the Youth World Championship competing against 374 of the world’s best youth sailors from 60 nations. Rose raced against defending champions, Dolores Moreira Fraschini, (URU and the 2017 Youth Radial World Champion, Hannah Anderssohn (GER), pulling out to dominate the 40-boat competition. “After a tough week of racing the fact I am a World Champion has still not set in. I find myself still astounded by my achievement even with all the best wishes and recognition I have received,” Rose said. “It was a tough last race to win gold but I did it. I knew what I needed to do and I did it. I am especially grateful for my coaches, Rosie Chapman and Leandro Spina of US Sailing, for believing in me. I am very grateful for HYC for their positive thoughts and support from afar. The utmost thanks goes to my family who have and always believed in me and supported my dream I cannot thank them enough, they earned this gold medal too,” Rose added. Rose earned her spot in the World Championships as the only single-handed sailor on the US Youth World Team through hard work, determination and finishing at the top in the most competitive national regattas during 2017. Rose is a senior attending Westside High School in Houston. 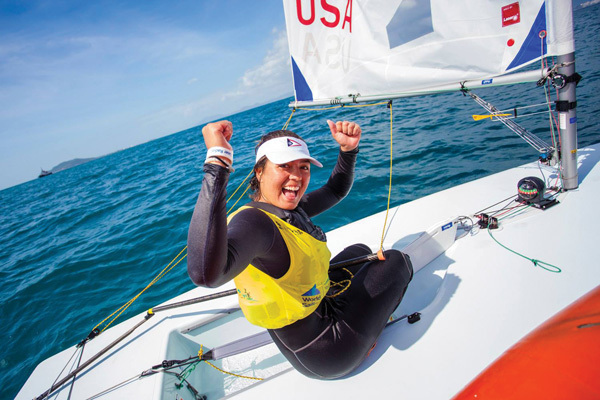 She has sailed in a wide variety of national and international sailing competitions including representing the USA in the International Laser Radial Youth Worlds competition in Canada, where she placed 3rd in the Under 17 category. 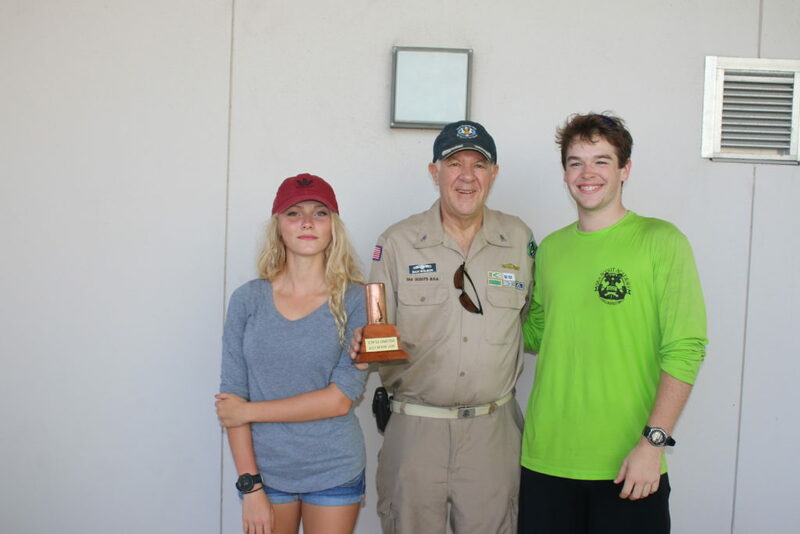 Sea Star Base Galveston recently hosted the 9th Biennial William I. Koch International Sea Scout Cup Regional Regatta Trial, “Aggie Cup”, Saturday, September 23, on Offatt’s Bayou, 7409 Broadway. 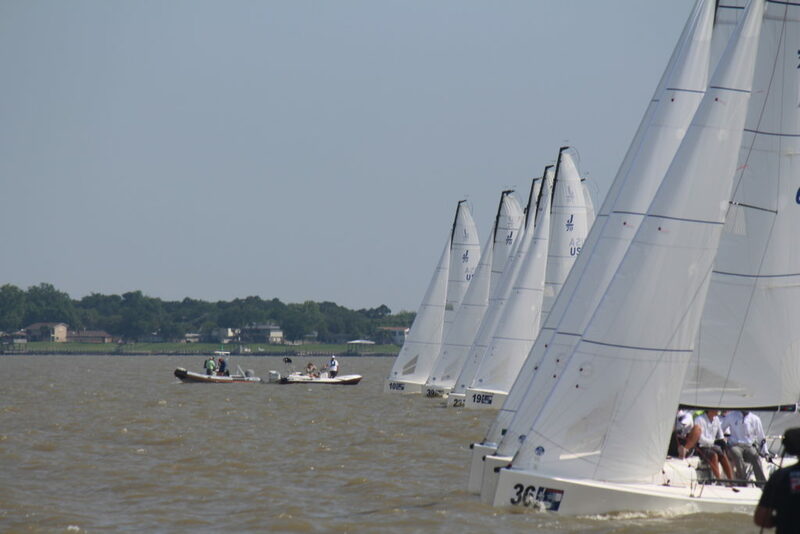 The oldest continuing qualifier for the Koch Cup, the regatta is open to any Sea Scout Crew in a Southern Region Ship, and is one of four races held in Scouting’s Southern Region. 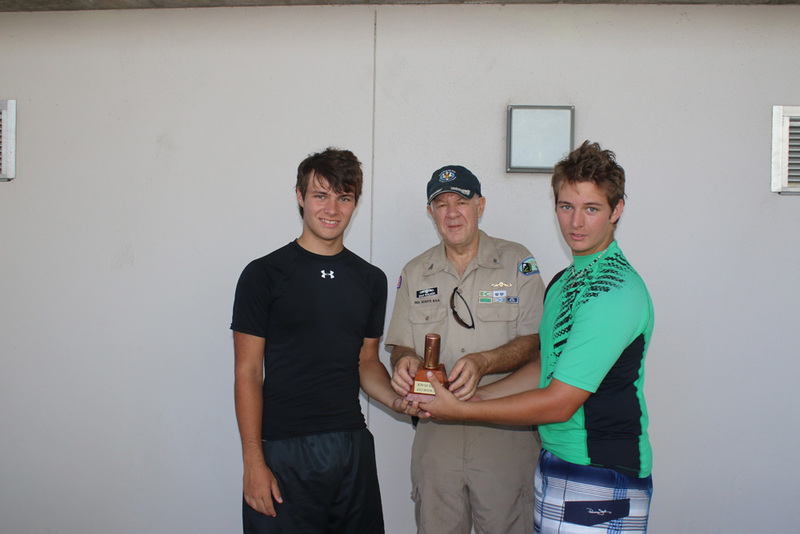 Qualifiers from the regatta will compete in the William I Koch International Sea Scout Cup to be held at Sea Star Base Galveston in 2018. Regatta Director is Skipper Dan Wilson, Commodore of Sam Houston Are Council that includes Houston and the surrounding 16 counties. 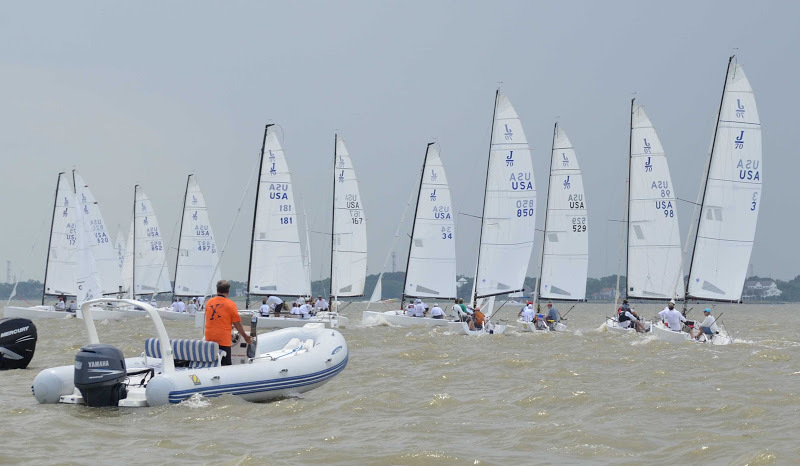 Admission to the race was open to all Southern Region and is governed by the ISAF Racing Rules of Sailing 2017 – 2020, Boy Scouts of America Guide to Safe Scouting, posted Aggie Cup sailing instructions and the Official Notice of Racing, the regatta is a Sea Scouts, BSA event. 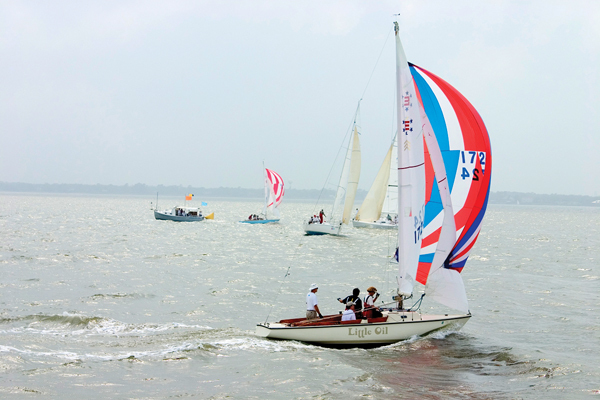 Sailors compete on FJ’s, or Flying Junior, which are popularly used to teach young sailors the skills of boat handling and racing. Sea Star Base Galveston is a high-adventure aquatic destination offering marine and maritime education programs that foster teamwork, skills, lifetime leadership, and independence in body, mind, and spirit. The Base offers sailing and educational programs for youth, adults, and physically challenged individuals. 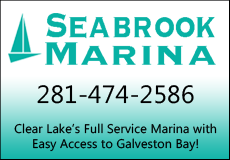 For information on upcoming regattas or SSBG Community Sailing programs go to www.ssbgalveston.org or call (409) 572-2560. 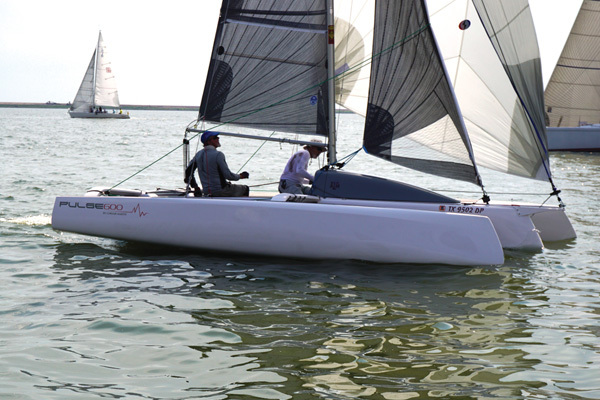 The 50th Anniversary of the A-Class North American Championship was held in San Diego Bay on Oct. 5-8. Hosted by San Diego Yacht Club, the event was held on the Silver Strand State Beach which is halfway down Coronado Island. The sailing area was well protected with flat water and great racing conditions for the Classics and Foilers alike. San Diego is a long way from the larger East Coast fleets in the US, but the A Catters saddled up and headed west to support the Californians. We had 32 boats racing from all over, including Mischa and Eduard from the Netherlands, Larry Woods from the Toronto area, a container load from New Jersey, a 6 boat trailer from Atlanta, and many smaller rigs coming from Florida, Louisiana, Texas and all over. Ben Hall a.k.a. “The Admiral” drove 2,500 miles with Bill Vining from Tampa, Florida to get three boats from the Sopot Worlds there just in time, and he wasn’t even sailing! It was another good example of the quality of people in the A Class. Due to the flooding in Houston from Hurricane Harvey, there was a fair bit of debris in the water at home. My training partner Benn Hooper and I decided to head out early to sail in San Diego to keep the boats in one piece. We drove 24 hours straight through and sailed for 6 days prior to the event. Mischa joined us and we spent a lot of time on setup and techniques to maximize our performance, with Benn in the Classic as a good benchmark. Ben was on his recently modified Classic LR5 with the long leech version of Mischa’s Decksweeper, while Mischa and I pushed the F1’s with a smaller head design. It was a bit of a gamble in the short term as San Diego is not thought of as a windy venue, and conventional wisdom pointed to light airs being the Achilles heel of a small headed sail. It was great testing though and the new sails performed well across the range. As always when I get the opportunity to train early with good people before a championship, I could pack up and go home the night before the regatta and be perfectly happy, as I find it really satisfying to learn so much and progress in how to sail these amazing boats. We pulled off the regatta with Foiling conditions throughout, except for small sections of a leg or two. The breeze was on average 7-12 knots, some less and more on the last day. There was only a bit of short chop on the last day near the bottom when the breeze was up in the mid-teens. The pressure was always changing just a little bit throughout the trip, so you really had to stay on your toes with the mode and setting changes. Often times you weren’t in exactly the ‘perfect’ setting, so learning to keep the boat ripping while managing that aspect was a big part of the regatta. The SDYC Race Committee did a great job getting off 11 good races over four days. They kept us apprised of their intentions and were great with communication, which we all appreciate. The battle for the Classics division was never over, with a different leader at the end of each day. Craig Yandow came out on top, and there were a lot of tight finishes across the line throughout the week. Great to see some new energy in that group and I believe the US will send a good Classic contingent to Australia for the Worlds. 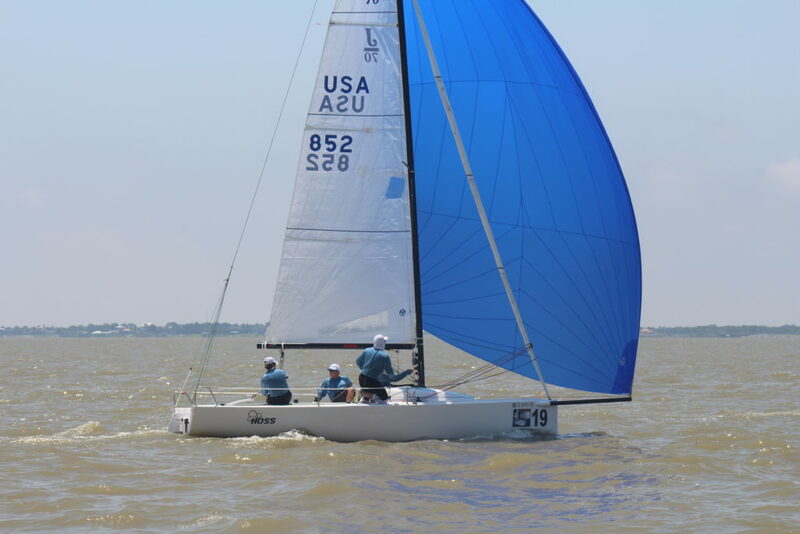 Matt Struble sailed a solid event in the eXploder I used in Poland, and thank you again to Emmanuel Cerf from eXploder USA for helping me at the Worlds and Matt here at the NA’s. Emmanuel is a great promoter of the class, and motivates our sailors to get to our events. He is the man behind the 2020 Worlds in St. Petersburg, Florida. Be sure to put that on your long term planning, as it will be truly first class. 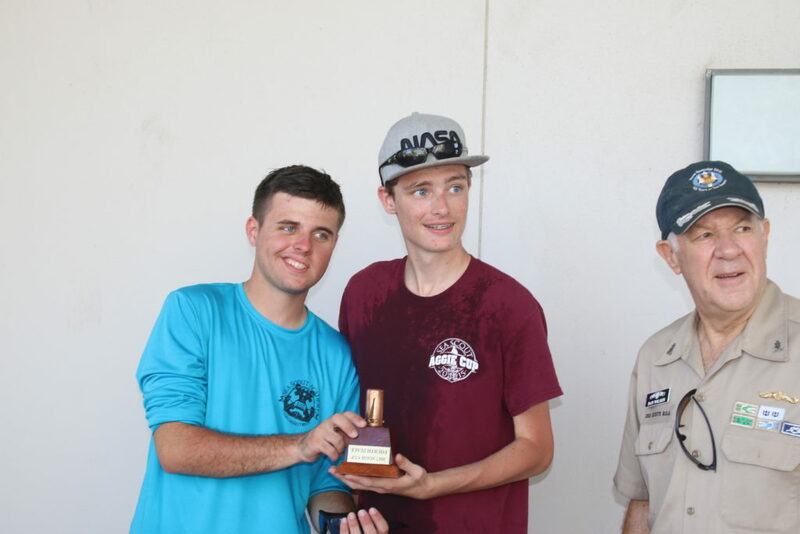 Mischa won the event as Open Champion, with his blazing speed and complete command of the boat. It was great to have another fun mission with him, and we hope in the future to have more international competitors here to raise the level even higher. The perpetual trophy for the Open Champion has gone missing (if you have it, send it back…), so the Regatta Organizers did a cool thing with a Multihull Elapsed Time Trophy that they award each year. By their reckoning, having won 9 of 11 races means Mischa completed the regatta in the lowest elapsed time, so his name is now on the trophy with ORMA 60’s and other offshore Multihulls. After some good battles with Mischa and Matt, I was fortunate enough to come away as North American Champion, and looking at the trophy my 2 wins pale in comparison to the multiple winners over the 50 year history of the class in the US. The trophy has the winning skipper and boat type which we will post shortly on our US Class website. Apparently even Hurricane Andrew has a victory in 1992, but no boat type was listed. It’s pretty cool to think for half a century A Cat sailors have been throwing boats on trailers and traveling around the country for the fun of it. I’m happy to be one of them. The 2018 North Americans will be at the Sandy Hook Bay Catamaran Club in New Jersey. 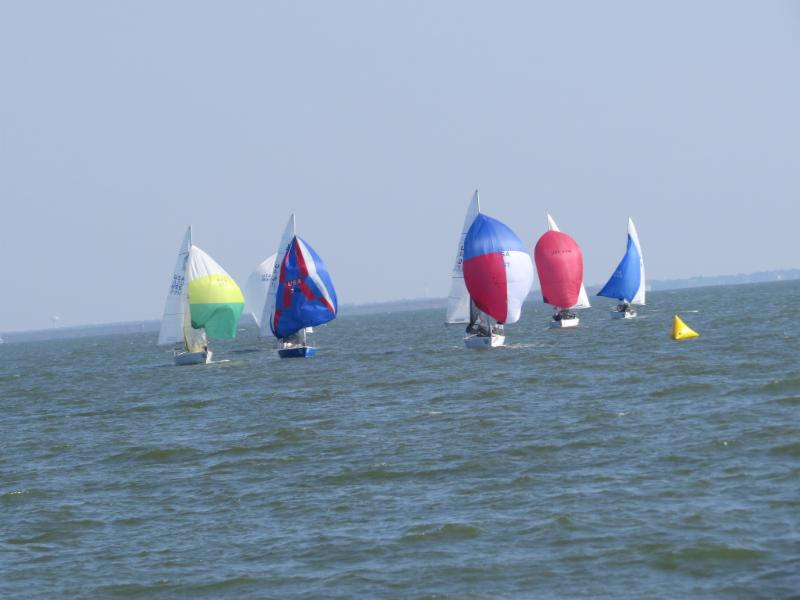 The club is just across the water from New York City and has hosted the Atlantic Coast Championships the past few years. It should be a great event. From there the US Fleet will be loading containers to head down under to Hervey Bay for the 2018 Worlds. Come and join us! 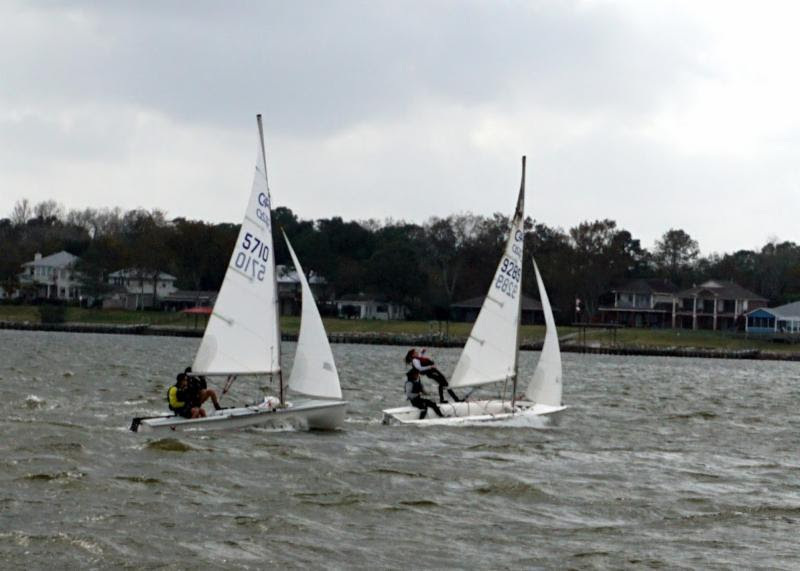 Registration is now open to race in the annual Houston Yacht Club Turkey Day Regatta Saturday and Sunday, Nov. 18-19. 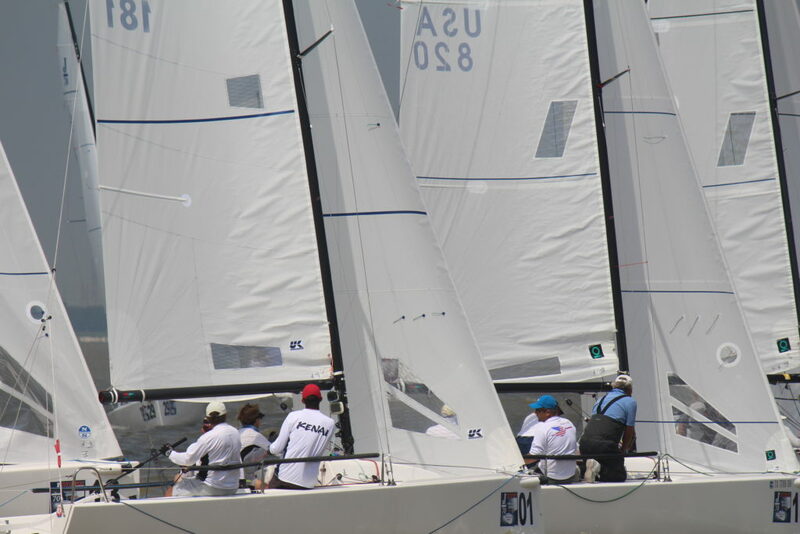 The regatta is open to all boats and classes for racing Windward-Leeward or Pursuit. Prizes are turkeys. The number will be based on the number of registrants per class. Our annual “Grog” party will follow racing on Saturday. As part of the Competitors’ Briefing on Friday, Nov. 17, all racers are invited to attend a presentation by HYC Member and Laser Radial Youth Women’s World Champion, Charlotte Rose, who will share her on-the-water racing experiences and upcoming 2017 Youth Sailing World Championship in China later this year. She has been nominated for the 2017 Rolex Yachtswoman of the Year. The awards ceremony on Sunday, Nov. 20 will feature our chef serving up turkey and trimmings for the racers at the trophy presentation. 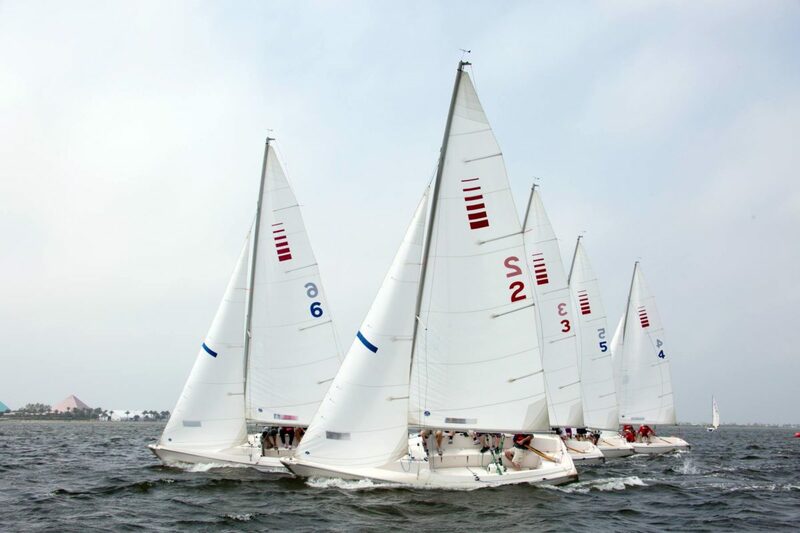 See the HYC Web Site for the Notice of Race for the schedule of events. Boats may enter the Regatta through Regatta Network. For further information, contact Event Chairmen James Liston jtliston@aol.com or Madonna Breen mbreen@embarqmail.com. All one design sailors mark your calendars for the HOOD Regatta. 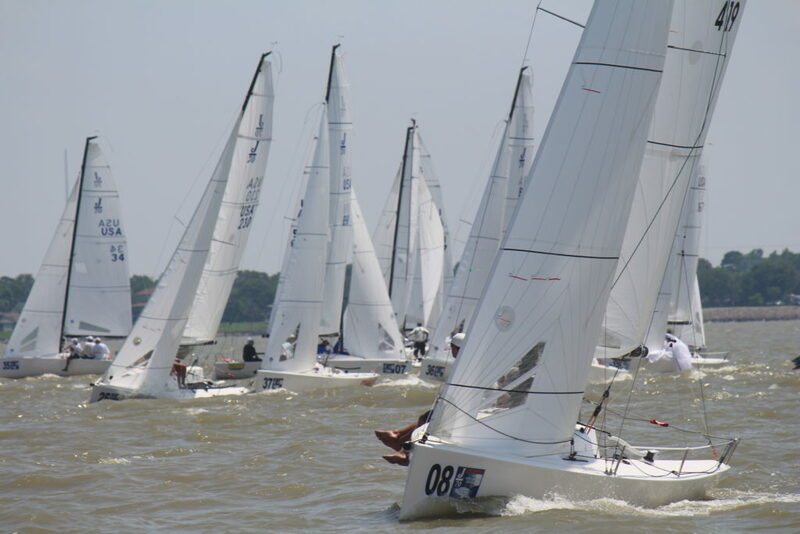 The Houston Open One Design Regatta is Sept. 23-24 at the Houston Yacht Club. Our sponsors for the 2017 event are Mount Gay Rum, Quantum Sails, Dripping Springs Vodka, Bloody Revolutions, KO Sailing, City of LaPorte and West Marine. We are expecting as many as 100 boats and 350 sailors to participate. 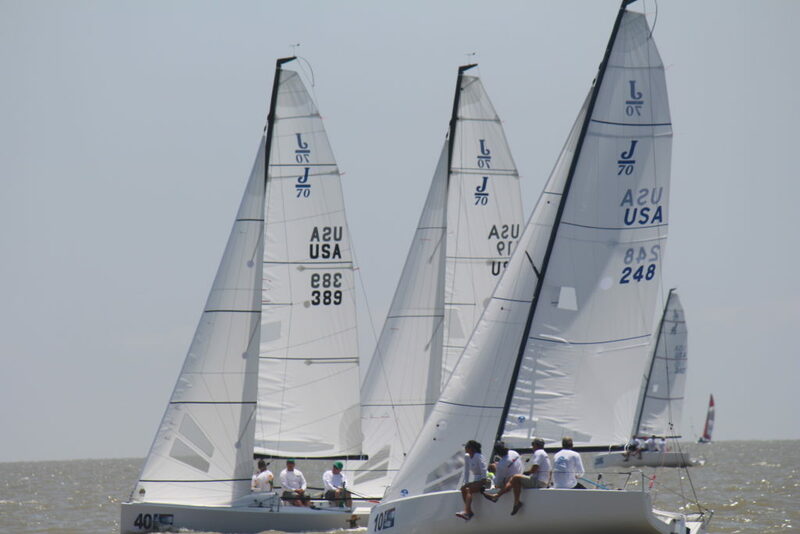 Classes anticipated to sail are J22, J24, J29, J70, J80, J105, J109, Pulse 600, RS Aero, and Ensign. There will be a youth line, as well. 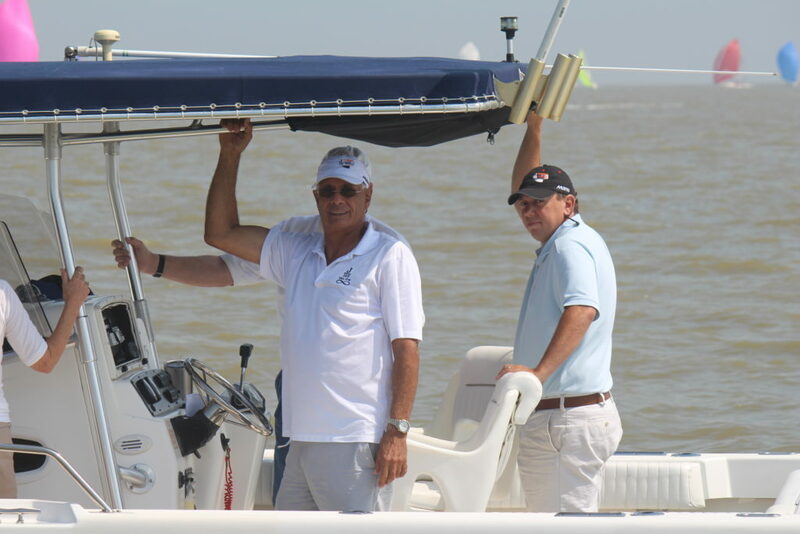 The racing will take place on three race courses on Galveston Bay. The Skipper’s meeting will be held Friday night, with racing on Saturday and Sunday. Awards will be given out on Sunday afternoon. Each boat registered will receive a skipper’s pouch from Quantum Sails and a tech shirt. 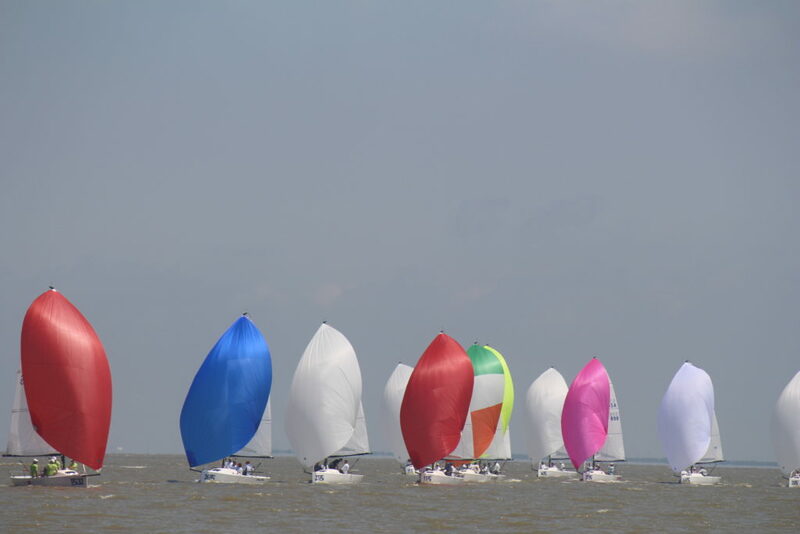 This will be the largest regatta on Galveston Bay this year, so please don’t miss it. 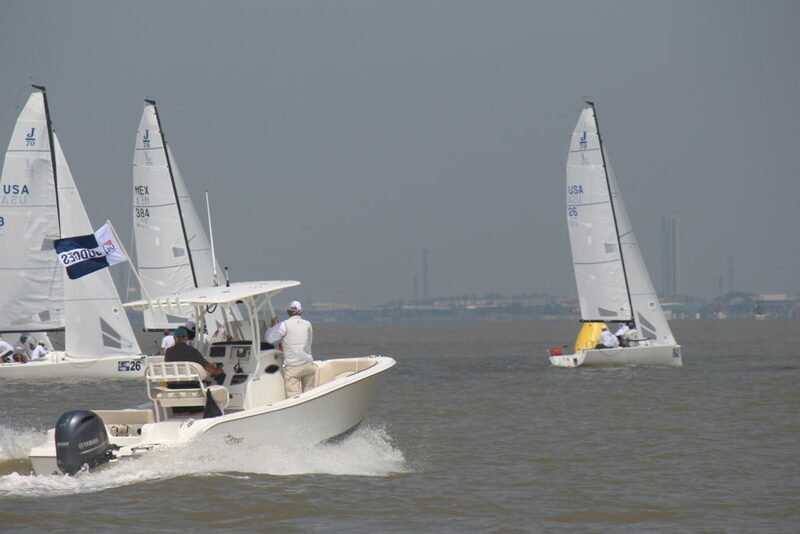 Check the HYC website, www.houstonyachtclub.com or regattanetwork.com for the Notice of Race and registration information. For more information, contact regatta chairs Ken Humphries at k.humphries@humphries-const.com or Joanne Humphries at humphriesj@hotmail.com. 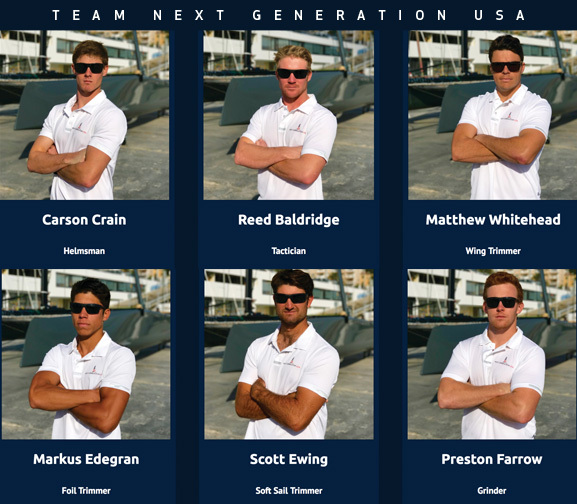 Team Next Generation USA. Photo by Theo Queen. The twelve teams that will compete in the 2017 Red Bull Youth Americas Cup competition are breaking new ground for young sailors all over the world. They will be racing foiling catamarans and that’s just the tip of the iceberg. All of the competitors, whose ages range from 19 to 24, are getting a taste of what the real America’s Cup teams must deal with in order to compete and perform well in this pressure packed arena known as the America’s Cup sailing. Fund raising is one of the new skills this team must acquire in order to stick around for the finals. Racing these boats is very expensive. Sails and hardware are pushed to the limits. The crews will train non-stop from now until June aiming to make the finals. All of this costs money. Next Generation USA needs your help. Six guys were chosen to represent our country and have a very good chance to win the regatta. Two of them, Carson Crain and Reed Baldridge, are local guys who grew up sailing right here on Galveston Bay. To make a contribution to the campaign, contact Carson Crain, cmcrain@gmail.com. Location: The Great Sound, Bermuda. 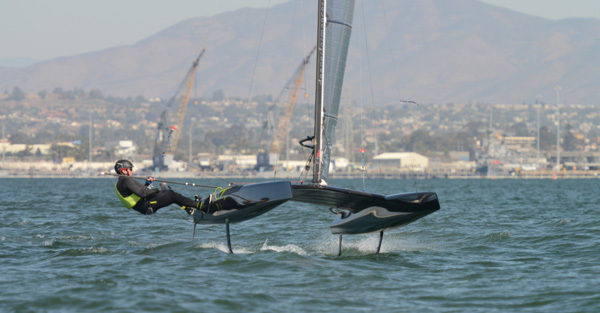 Boats: The AC45F, a 45-footer that will fly on hydrofoils. Specifications for the AC45F indicate the boat is capable of reaching speeds of over 35 knots, or 40mph/65kmh. The eight AC45Fs used in the Red Bull Youth America’s Cup are the only such boats in the entire world. In 2017, Bermuda’s Great Sound will form a natural amphitheater for the America’s Cup, and the Red Bull Youth America’s Cup will use exactly the same racecourse. Sailing conditions in Bermuda are typically exceptional in June, with historical wind data suggesting that there should be racing conditions 90 percent of the time. 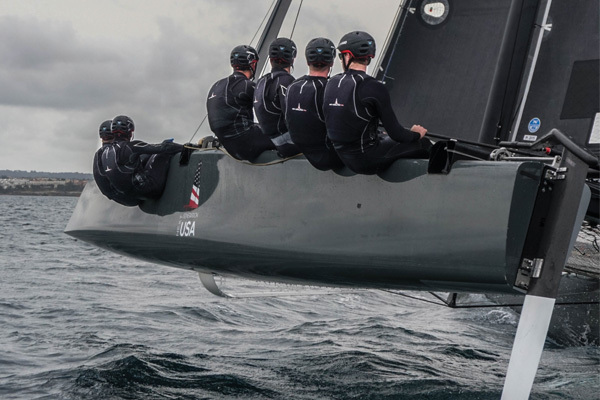 In 2017, the youth teams will be sailing the AC45F, a 45-footer that will fly on hydrofoils. Specifications for the AC45F indicate the boat is capable of reaching speeds of over 35 knots, or 40 mph/65kmh. The eight AC45Fs used in the Red Bull Youth America’s Cup are the only such boats in the entire world. Up to 12 national youth teams, each composed of six sailors aged 19-24, will race in the Red Bull Youth America’s Cup 2017, each representing a different nation. Six teams will race through their affiliation with current America’s Cup teams, while up to six additional teams will compete as selected by Red Bull Sport Directors Roman Hagara and Hans Peter Steinacher. 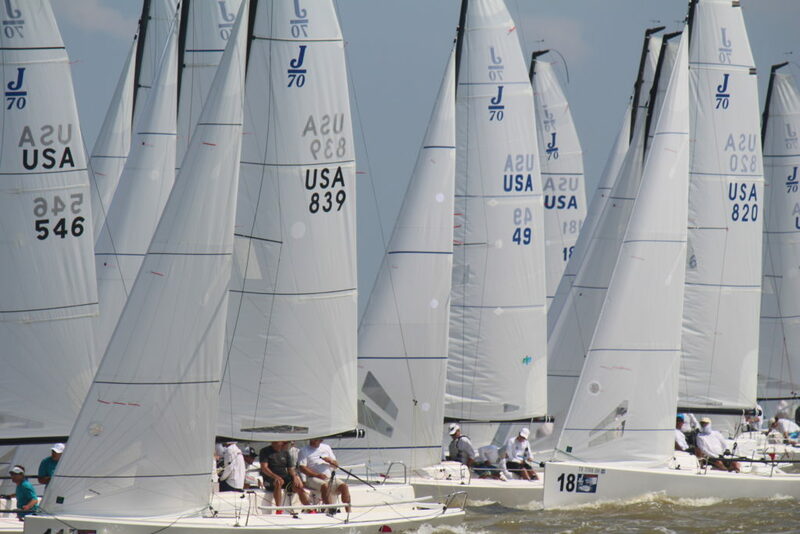 HOST: The OPEN 3v3 Team Race Regatta will be hosted by Sea Base Galveston. 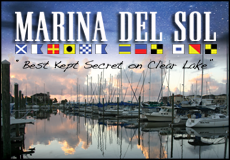 The regatta will be held at Sea Base Galveston 7509 Broadway, Galveston, Texas 77554. BOATS: Racing will be in FJs available through Sea Star Base Galveston. Collegiate 420’s may be used if demand warrants. FORMAT: The regatta will be open 3v3 team racing. The regatta will be governed by the rules as defined in the Racing Rules of Sailing 2017-2020. 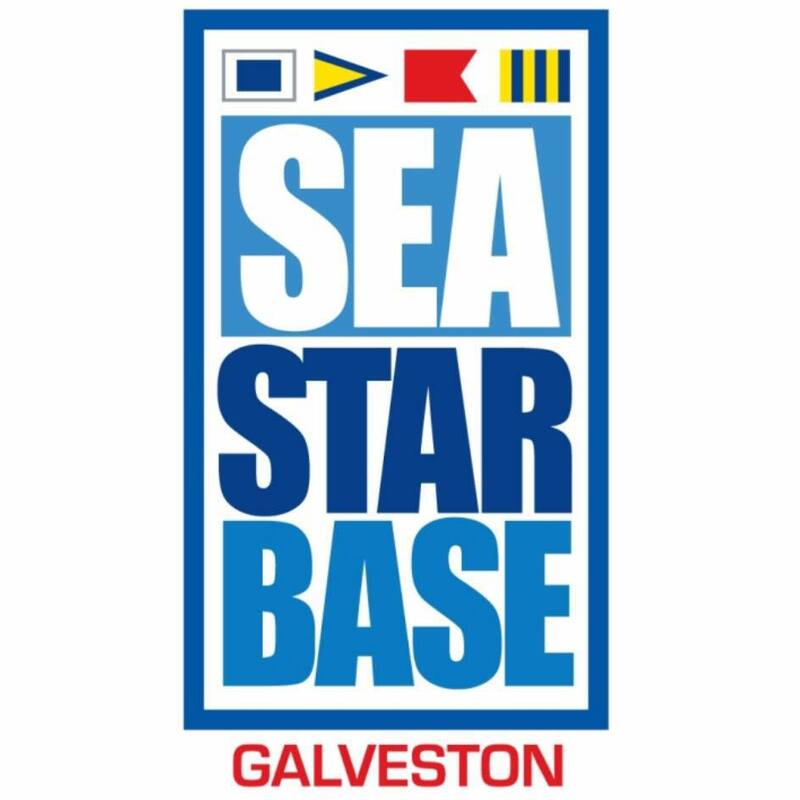 HOUSING: Housing will be available at Sea Star Base Galveston, the site of the regatta. Reservations should be made during registration on regatta network. SSBG is offering accommodations for $25/night/individual. These are apartment suites with shared bathroom; rooms can accommodate males and females). Housing reservations with SSBG should be arranged at least one week in advance. Lakewood sent three C420 Teams with Coach Marek Valesek to their first C420 Orange Bowl International Youth Regatta in Miami over Christmas break. 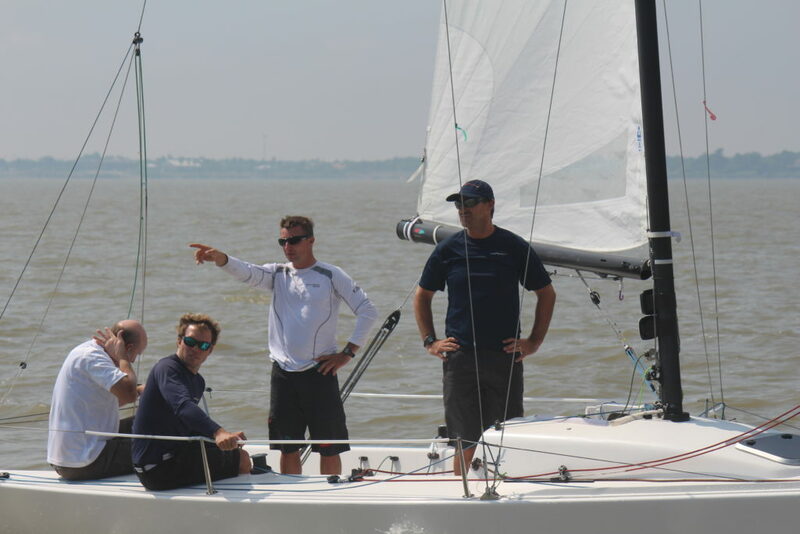 The two-person teams of Alex Wise/Laurel Tyson, Grace Bates/Pilar Blanco Midulla and Paul/Celia Houston as well as several other youth sailors were in full learning mode this past weekend, as accomplished sailor and Yale Assistant Sailing Coach Bill Healy afforded the racers his knowledge of C420 racing. 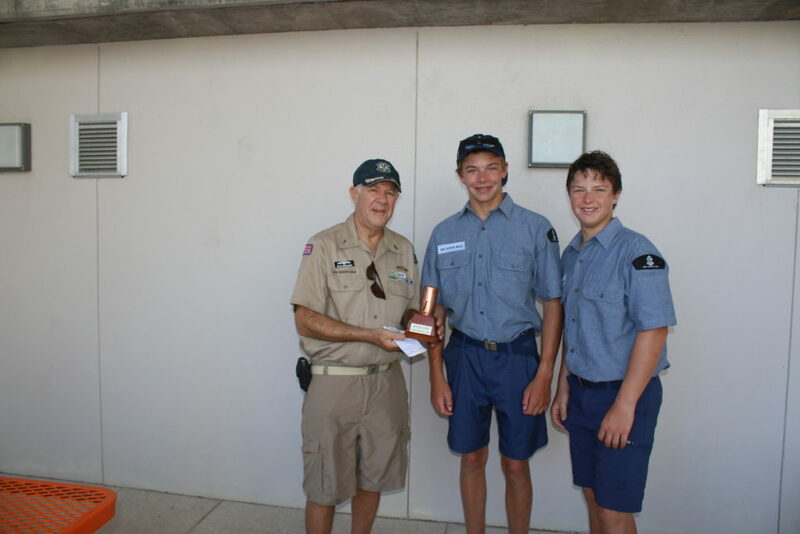 Healy, spent two days at Lakewood Yacht Club training the spirited young sailors. Strong 20-knot winds were enjoyed both days of the clinic, which focused on boat preparation, tuning guidelines, rigging the boats, and then basic trimming and hiking techniques as well as mark roundings. However, Sunday was 40 degrees colder than Saturday, so Healy, Valesek and the rest of the coaches utilized videos of high-level sailing to give the kids something to visualize. The young sailors took furious notes during the debriefings before braving the cold to practice the techniques on the water. A lot of kids went swimming, but there were notable improvements over Saturday’s performances. Lakewood wishes all it’s Orange Bowl competitors luck in Miami. 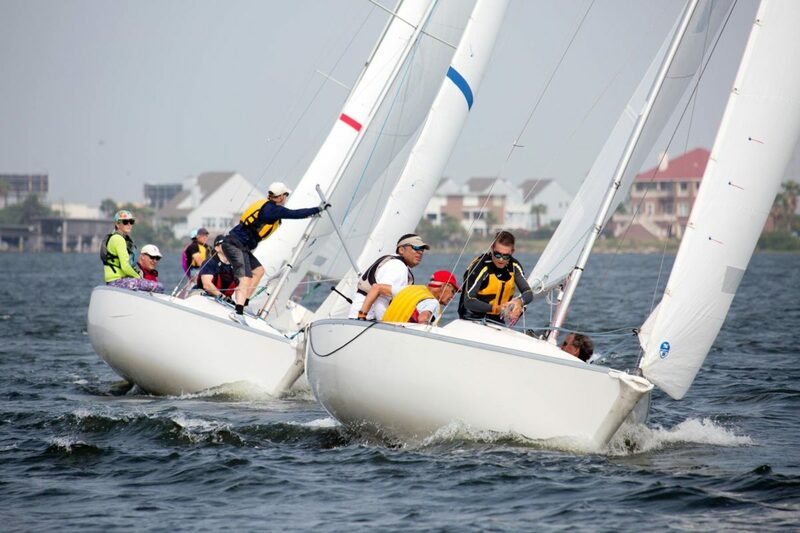 Visit www.lakewoodyachtclub.com to learn more about Lakewood Yacht Club’s youth sailing program. Rated among the top 10 yacht clubs in the United States, Lakewood Yacht Club (LYC) is one of the best-kept secrets on Clear Lake as well as the Greater Houston and Galveston communities. 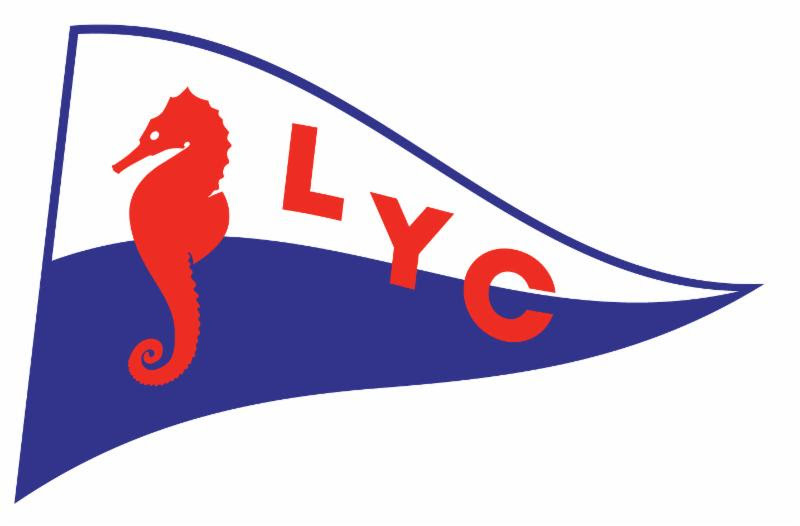 LYC is a private, member-owned club with great amenities to enjoy with friends and family. Located on 38 beautifully landscaped acres in the NE corner of Clear Lake, it’s an exceptional environment for social and water activities. 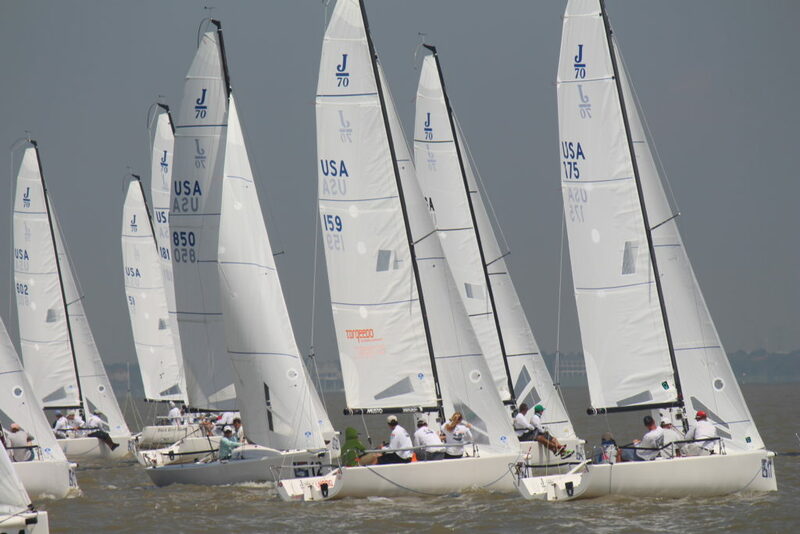 The championships were held right here in Galveston Bay at the new Sea Scout facility ( http://ssbgalveston.org/). It is an amazing facility and many in our community do not know about it, yet (here is a link to high schools already using it: http://ssbgalveston.org/community.php#anchor1). 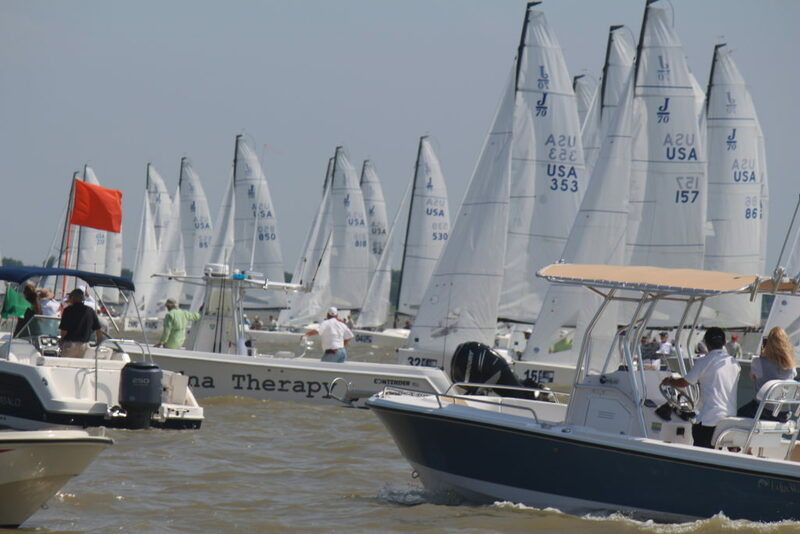 I recommend visiting this 200+ bed facility it and hope that it hosts many more regattas (Link to view facility: http://ssbgalveston.org/events.php AND http://ssbgalveston.org/events_contact.php). There were great views for watching the races… from shore! The downwind mark was only 20 yards away from the spectators. Sailboats are either built for comfort or for speed. The new Corsair Marine Pulse 600 Trimaran falls in the latter category. 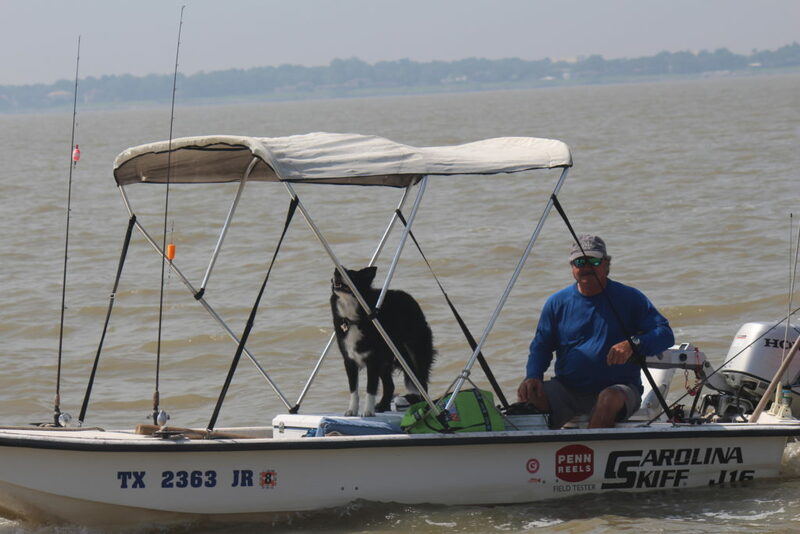 Longtime friends and Galveston Bay sailors Martin Hamilton and Bob Webbon recently purchased a Pulse 600. These guys have been racing catamarans for years so we thought it would be a good idea to ask them what they thought of the boat. What is your idea of the perfect sailboat? Martin: In two words stable and fast. For the last decade, I have been sailing a Condor 40 trimaran and an A-Class catamaran. The catamaran provided the opportunity to compete around the country in a single handed fast boat. The trimaran allowed me to entertain on a quick boat with plenty of stability (set a beverage down and come back later and finish it). Bob: The perfect boat? For what? For sailing? For cruising? For having friends onboard, etc. If it’s a perfect day sailing boat then it must have a groove. It should give back what you put in. It should have a feel that is pleasurable, it should take you away from the mundane of life. It should be exciting. There are plenty of great boats that do that. What do you like most about this boat? MH: The Pulse 600 is the new standard. It has the speed and excitement of an A-Cat and at the same time is stable enough for my wife and I to handle even in winds of 20+ knots. And the boat easily accommodates 4 adults. Perfect for a family outing. BW: The Pulse 600 is light weight so it is lively, responsive but forgiving. It’s quick in a breeze and remains fast with four people on board. It’s just downright fun. Get a little boom box on board with a nice cold beverage, sheets cleated doing high teens, what more do you need for a great afternoon. What is it that you most dislike about this boat? BW: Yes, it takes a bit more work, but it gives back so much more. Both of you guys are obsessed with speed, why can’t you cruise along like the rest of us? MH: I understand the desire to cruise. It is always easy to ‘throttle back’ and enjoy a beverage and conversation. But, you can enjoy the beverage and conversation even at top speed. BW: First of all I do have a cruising boat, but I’m just not obsessed with going slow. I can’t think of any other sport where slower is better. I think if more people knew they could set their beverage down on a boat without it spilling and they could actually sail much faster while doing that, they would figure it out. If you could describe this boat in one word, what would it be? These boats are pretty wide, are you having problems finding a slip? MH: We actually keep the boat on a trailer. The boat can be launched and motored with the wings folded. Bob and I are storing the boat with the wings extended at the Houston Yacht Club and are set up to launch from the crane. BW: Corsair Tris have been around for decades. Their folding systems are proven, so we can launch via crane, ramp or even wet sailed from a normal slip. Are you guys still friends, now that you own a boat together? MH: Bob and I actually owned a Tornado catamaran in the late 80s. We sold it after the Tornado Worlds. We continued spending a lot of time together sailboarding. Eventually in the early 2000s we both purchased A-Cats and have traveled the country together with our multi-boat trailer. Did I mention that it’s always been Bob’s idea? BW: I’ve been partners on sailboats and power boats. It’s always been great. I think that realization is what’s driving a growing part of the boating industry right now. Look at all the new boat sharing programs and companies. 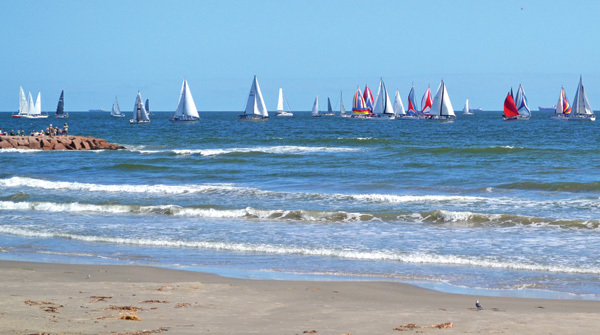 We now even have a community sailing program in Galveston. It just makes sense. There’s just no reason to feel like ownership has to be expensive. Partnerships also bring folks closer together through their shared interests. We’re better friends because of the boats we’ve owned together. 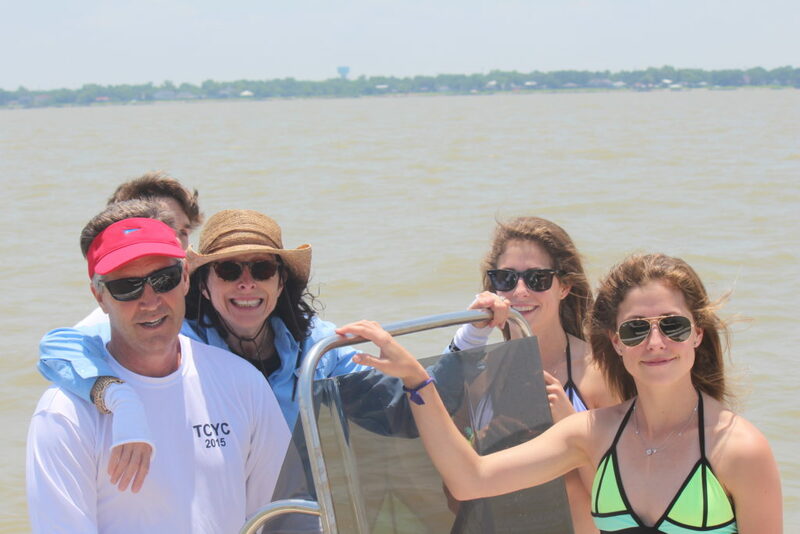 You both grew up sailing on Galveston Bay, what is it about this place that you like most? MH: It’s such a great sailing area. Lots of water and wind most of the time if you’re willing to wait for the shore breeze. BW: Wind. Unlike a lot of other sailing venues we seem to have more wind. We also have great racing organizations on the bay. Harvest Moon racers could be seen off the Galveston beachfront. Photo by Kelly Groce. More than 140 boats took off from Pleasure Pier in Galveston on a beautiful, clear Thursday afternoon and raced down the coast to Port Aransas to complete the 30th Annual Harvest Moon Regatta.® Saturday, Oct. 15 was a busy day as the sailors were treated to a barbecue dinner and awards banquet followed by the Welcome Sailors Rum Party. Lakewood Yacht Club was well represented among the race winners. John Barnett seized the coveted Bacardi Cup; Ted Greak earned the Cameron Cannon; Charles Herpich won the Commodore/John Broderick Memorial, and Jim Demarest took home the PHRF Spin Overall. Other Lakewood members who achieved top finishes in their divisions include: First Place winners Kevin Tyrrell, Ash Walker, Uzi Ozeri, Bob Giles, and Randy Pike; Second Place winners Carl Drechsel, J.D. Hill, Jay Zittrer, Cran Frasier, Taylor Smith, Gerhard Wittich and Richard Fawcett; Third Place winners Al Goethe, J.D. Bednar, O.J. Young, and Fred Pounds, and Fourth Place winners Robert Crosby and Gregory Way. Visit www.harvestmoonregatta.com for the full results. 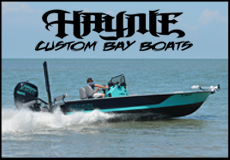 This annual race is organized by Bay Access, a charitable organization supporting amateur racing. 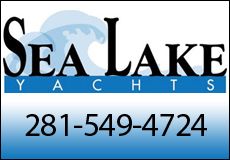 It is hosted by Lakewood Yacht Club, the City of Port Aransas and Port Aransas & Mustang Island. Aside from Harvest Moon Regatta title sponsor Bacardi U.S.A., other gracious sponsors of the 30th Annual Regatta included the City of Seabrook, all Bay Access annual race sponsors, Banks Sails, Windward Sea Ventures, Alliant Marine & Energy Insurance, Boatpix.com, Mantus Anchors, The Yacht Sales Company, Edna Rice Executive Recruiters, RejeX.com, Optima Marine, Faron Daigle Realtor®, Superior Marine Services, True North Marine, Coast Guard Foundation, Little Yacht Sales, North Canvas and Upholstery, Davis Marine Electronics, Gulf Coast Mariner Magazine, Ocean Navigator, Eagle Maritime Services, Inc. Saved by Spot, The Insurance Navigators, Fishbones Safety Solutions and Energy Services, Triumphus, Laguna Harbor, Oj’s Marine and several others. Congratulatulations to all the race winners and thanks go out to the numerous volunteers who helped make this a great event. If you have questions about the race or have an interest in sponsoring next year’s regatta, visit www.harvestmoonregatta.com. The 7th Annual J/Fest Southwest Regatta Skipper’s Meeting is scheduled for 7:30 p.m., Friday, October 28 in the Lakewood Yacht Club Ballroom. J/Fest Southwest, hosted by Lakewood Yacht Club, will take place in Galveston Bay October 29-30. Entries in this year’s race include J-boats ranging from 22′ to 40′ in length. Saturday evening, the L.C. Roots band will provide live entertainment and a traditional “Frogmore Stew” shrimp and sausage boil and drink specials will be available on the Lakewood Yacht Club grounds. The awards ceremony will be held Sunday, October 30 in the Lakewood Ballroom. Questions about the Skippers’ Meeting or the J/Fest Southwest Regatta should be directed to Dave Christensen at dc1sail@comcast.net. For information about the event or event accommodations, visit www.jfestsouthwest.com. 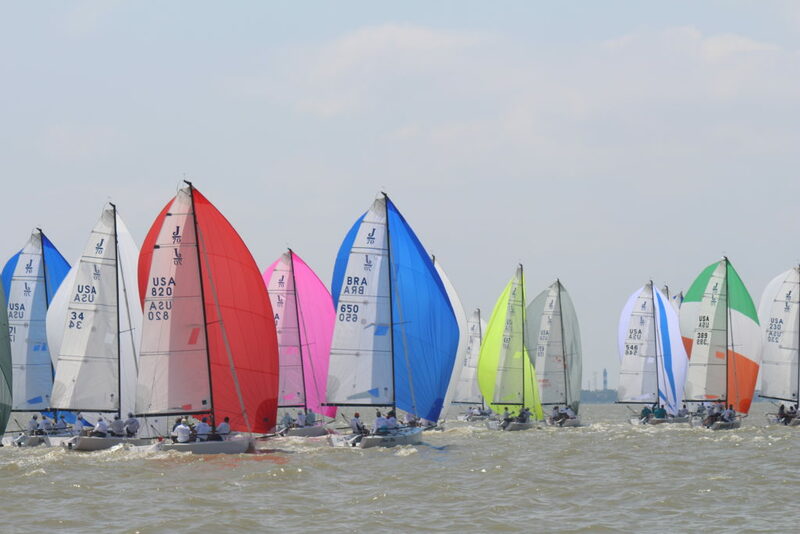 The Texas OPEN Short-Course Fleet Racing Regattas will be hosted by Sea Scout Base Galveston at Sea Base Galveston, 7509 Broadway, Galveston Texas 77554. The regatta will be OPEN short-course fleet racing (10-15 minutes per race), available to high school, college and seasoned dinghy sailors. If more than 18 teams (i.e., skipper and crew) register, two fleets may be designated. Boats will be assigned to competitors, and there will be no rotation of boats. The regatta will be governed by the rules as defined in the Racing Rules of Sailing 2013-2016. Everyone is encouraged to bring a refillable water bottle. 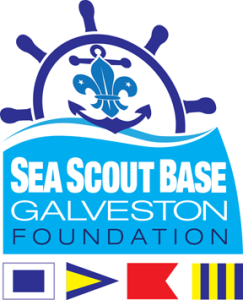 Housing will be available at Sea Scout Base Galveston, the site of the regatta. Reservations should be made directly with Eva LaFour (409-572-2560 x1002). Sea Base is offering accommodations for $50/night/person. These are apartment suites with shared bathroom; rooms can accommodate males and females). Housing reservations with Sea Base should be arranged at least one week in advance. 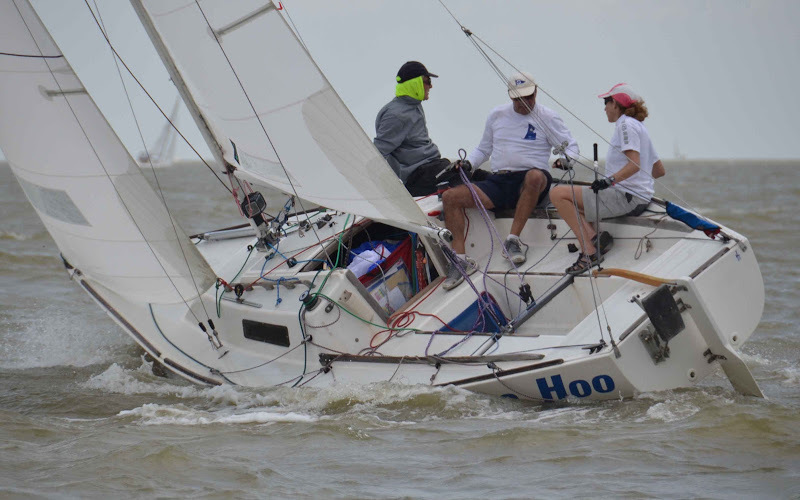 Houston Yacht Club member Dean Snider is a four-time Ensign National Champion. What makes him so good? Where were you born, and what was your childhood like? I was born near Somerset, Ohio a small town in the foothills of the Appalachian Mountains. I was one of nine siblings that provided the work force for the operation on the Sniders Family Dairy. Being one of the youngest siblings, I was not involved in the major jobs on the farm, but was kept busy with appropriate farm activity. The farm was sold when I was eight years old so I had a major change in my life when we moved to Celina, Ohio. The home in Celina was very close to the water front on Grand Lake. The lake originally was built to provide a water supply for the Miami/Erie canal and was five miles wide and ten miles long. 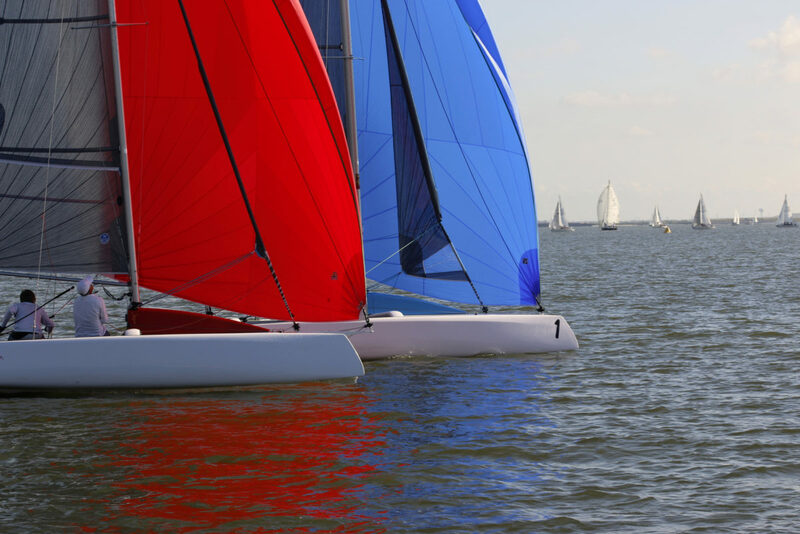 How did you get started racing sailboats on Galveston Bay? Racing Sailboats did not enter my life until I graduated from College. I went to work in New Jersey at an EXXON refinery. In the next year, my bride to be graduated from College and we were married. She worked for UNION CARBIDE in New York. One of our early trips was to Cape Cod. To entertain my new wife (Kay) I rented a sailboat and we had a pleasant sail. She was a quick learner and liked the activity. A month after we were married, the EXXON refinery where I worked had a major strike by the union workers. The strike lasted about a hundred days. The first thirty days I spent in the refinery running one of the units. The fallout of this activity resulted in a bonus that we had to spend. We wanted to join a Golf Country Club but that was too expensive and public courses took too long to play. So we bought a sailboat and raced it at the Nyack Boat Club on the Hudson River. The sailboat was a Lightning and the prior owner volunteered to teach how to sail the boat. He was a racer and since there was a race the day he took us out, we entered it and finished mid fleet. We thought it was so easy and if we could get another engineer from the refinery and with a three engineer crew, we would be winning races. As it worked out the only race we won was four years later. The race was at the end of the season that year and it was only open to the fleet members that had not won a race that year. It was a long four years, but we learned a lot! After the “win” we had to sell the Lightning because of a transfer to Houston. The second day in my office a gentleman walked in and identified himself as Hank Arnold. He did not want to talk about business. He was a sailor, a member of Houston Yacht Club and raced his Ensign. During the next two weeks, Hank became the sponsor on our HYC application and we bought an Ensign. This was in 1967 and we have actively raced it since then. What is some good advice about starting in big fleets? One of the things we had to learn early in our racing career was how to start in large fleets. Both the Lightning Fleet and the Ensign Fleet routinely had 15-20 boats on the starting line. We have found that a lot of homework is required on the water before the start of the race. Information that is helpful to getting a good start include, the favored end of the line, the time it takes to travel the length of the line, which tack is likely to be favored at the start, the frequency of wind shifts and which end of the line you want to start at. The Lightning and the Ensign that we raced are not dinghies. Unlike dinghies that can sit on the line and trim in the sails at the gun and accelerate quickly, the Ensign at 3000 pounds does not do that. 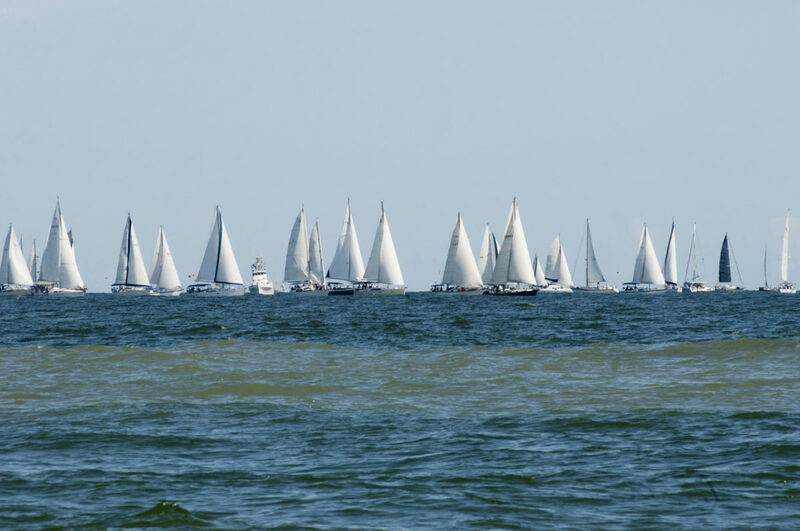 Since it is important to get to the starting line close hauled and at full speed it is important to know how far in various wind conditions that you need to be from the starting so that when you harden up, you hit the line at the starting gun. Ensign National Events with 40 plus boats on the line required a starting line that is in excess of a thousand feet long. It requires more planning and picking your “spot” to start well and be there at the gun. The favored end is usually crowded so you have to decide whether to “duke” it out there or go for a start in a “hole.” I have had success and failures in both situations. In the failures, it is important to get to clean air as soon as possible and get in phase with the wind shifts and current at those sites that have significant current. It is important to find a clear lane to sail in after the start to minimize the number of tacks. This is hard to do since you don’t know when somebody is going to tack and give you dirty air. Sometimes if the penalty to tack and get out of dirty is large if may be best to ride out the dirty air. Lots of judgment decisions are required on the race course! Since we are now racing in a much smaller fleet, the starting line is generally only 30 seconds long. Position in the last two minutes of the starting sequence is critical. Based on the other boats position, you have to evaluate who is going to be late, early, and position yourself to take advantage of the information obtained on the water prior to the start. What do you look for in a good crew? The most important element in racing an Ensign is having a good crew. The best situation is having a good crew that is compatible and can race with you all the time. It is most important that the crew really enjoys being on the water. The rest of the stuff falls into place. The ability to recognize headers and lifts on the weather leg, agility and strength to hike, understanding sail trim, and stamina to make it around the course all comes with experience. This experience can be gained on other boats, but is easily transferred to the Ensign. I had the pleasant experience of racing with the same crew for 35 plus years. 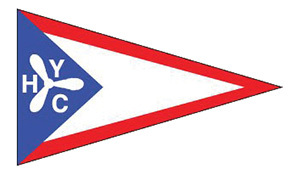 It included Frank and Sandy Kelley (we purchased their Ensign in 1967) and my wife (Kay). Frank and Sandy seemed like nice people, and since we did not know anybody else in Houston, we invited them to crew for us. Five years later, the Kelley’s bought a Catalina 25 and later switched to a Morgan 27. As long as the Kelley’s owned a boat we crewed for them in GBCA races and they crewed for us on the Ensign. This was intense racing for the four of us, but it was also great training for the crew. We all learned all the positions on the boats and became a stronger team. Several people made the comment that when Frank injured himself, I felt it!! It was a wonderful experience to know and race with the Kelley’s. They crewed for us in most of the National and Regional events that we attended, including three of our four National Championships. It was a challenge when we had to train new crew. We had not talked about the crew functions for 25 plus years and it was hard to figure out what the Kelley’s did. Whatever is was, it was good!! Tell us about racing with your wife. Racing with my wife Kay is one of delights of my life. Over time, she became the “crew steward” (protecting the crew’s union rights), still is a great crew and loves to sail and race. She keeps the boat gear organized during the race, can jibe the pole if necessary, trim the jibe and make on the spot repairs if needed and points out items in need of repair. If there is rigging problem during the race she can isolate the cause and correct it without the Skipper needing to take his attention off sailing the boat. Once in a while we have a disagreement on the boat, but have learned it is best to wait until the next day to resolve the issue. This is working better and better as the years go on. My memory is getting worse with time so most of the time I don’t remember the problem. 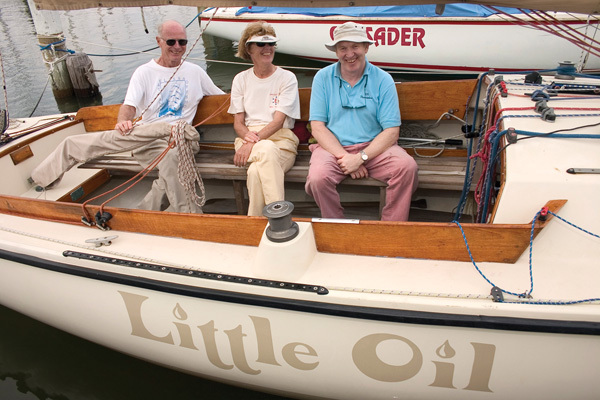 Your boat is named Little Oil, how did you come up with that name? We purchased a new Ensign in 1980. It became a problem because there were so many naming options. Our prior boat was named Striker II and the origin of this name was because the boat was bought with a bonus from a union strike at the Exxon Refinery where I was employed. We ended up using a link to our life as a basis for the name. In 1980, I moved from a large oil company to a small oil trading company. Kay still worked with Exxon so we played with the idea of naming Big Oil on one side and Little Oil on the other side. Little Oil finally won since the Ensign is a “little” boat. I am happy to report that our prior Ensign (517) is still active and competitive when raced!